Deep into their matchup with the New England Patriots in the AFC Championship, Patrick Mahomes and the Kansas City Chiefs lined up on the goal line with two minutes left in the game. Mahomes handed the ball off to Damien Williams, who shot through the gap and notched his third score of the game, finalizing a stellar performance (and even better dance moves) that can only be seen as a window of immense production to come when he’s given a full season of premier back opportunity. Williams’ advanced stats, metric and analytics player profile flaunts upper echelon athleticism — including both pass catching and inside grinding efficiency — paired with a prolific Kansas City offense that projects to give Williams workhorse-level touches over less talented competition in Spencer Ware. Damien Williams has an opportunity to return RB1 level value outside the first few rounds of redraft leagues. Williams would also be a must-buy in dynasty leagues assuming the Chiefs do not sign a top tier free agent running back or select a running back in the first couple rounds of the NFL draft. With a well-rounded skill set and elite athleticism paired with a premium share of the best offense in football, Williams is an essential target for “zero RB” drafters in 2019. After the fallout from the Chiefs’ release of running back Kareem Hunt earlier in the season, the team has offered Williams a two-year contract extension worth $8.1 million, keeping him under contract through 2020. Following Spencer Ware’s injury during the back half of the 2018 season, Williams has exceeded expectations as the Chiefs’ lead back. Booming production and rapport with Mahomes has been the calling card of Williams’ playoff performances. All these factors look to increase trust and confidence that Andy Reid and the Chiefs have in the fifth-year running back. Williams will be in an opportunistic spot to capitalize on his newfound role in this prolific Chiefs offense come the 2019 season. Williams has a unique build that sets him apart from the rest of the Kansas City backfield. His “Satellite Back Plus” mold at 5-11 and 222-pounds, presents a unique BMI that allows him to both catch passes and force missed tackles out wide, as well as run inside and receive goal line carries. Williams posted a 113.2 (94th-percentile) Speed Score and 4.45 (91st-percentile) 40 time, as well as a 120.9 (62nd-percentile) Burst Score. Williams is an elite athlete at the RB position while also being a talented runner and pass catcher. Throughout the 2018 season, Williams posted a 34.2-percent Juke Rate and a 95.8-percent Catch Rate alongside 1.7 Red Zone Touches per game. Kansas City has shown that they trust the fifth-year back and are willing to put him in a position to succeed, whether it’s catching passes similar to a traditional satellite back or handling inside runs close to the goal line. Recent production and performance in the playoffs have certainly fueled interest in Williams, he still remains under the radar to the average redraft fantasy gamer. If elite athleticism and talent aren’t enough to convince zero RB enthusiasts that Williams is a must-have in drafts, then his supporting cast certainly should. Kansas City rolled through the entire league during the 2018 regular season, showcasing a league best 34.2 percent offensive DVOA according to Football Outsiders. Patrick Mahomes threw for 50 touchdowns in 2018, thanks in part to a league best 82.9-percent Protection Rate. 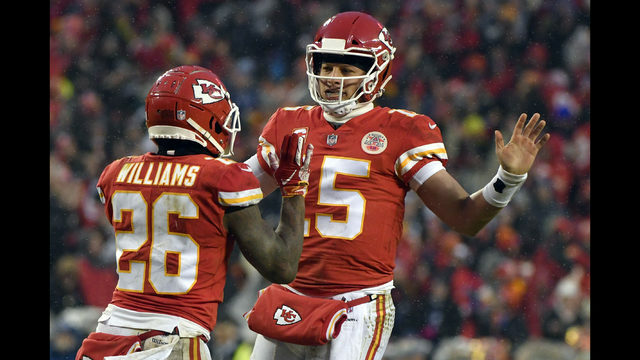 Kansas City’s high powered offense spells increased production for Williams in 2019. As a satellite back plus, Williams is in line to receive a large volume of passes, as well as the ever important goal line work that comes with the prolific Kansas City offense. Throughout the 2018-19 playoffs, Andy Reid showed a willingness to give Williams the ball at the goal line often. Barring a running back draft choice by the Chiefs in the upcoming 2019 draft, Spencer Ware figures to be Williams’ only real competition as the primary back. Fantasy gamers have bought into the Spencer Ware RB1 pitfall, and Williams is seemingly thought of as a change of pace pass catching back. The problem with this, of course, is Williams has an all-purpose skill set, while Ware does not. Ware is primarily a pass catching back and just an average runner with the football. Where Ware and Williams differ greatly is their athletic profiles and running efficiency. Ware’s bottom-tier 37th-percentile Sparq-X score of 107.6 headlines an all-around unimpressive athletic portrait, putting him well below Damien Williams. As a runner, Ware also runs exponentially less efficiently than Williams. Ware posts a 5.9-percent Breakaway Run rating and a 6.2-percent Dominator Rating, running less efficiently than Williams in the same offense. Williams shows all the traits of an all-purpose every down back. Ware is not #BadAtFootball, but he lacks the tools that Williams has in abundance. Going into 2019, Williams has the ideal profile for zero RB drafters to target: elite pass catching skills, efficient running and an expanded role in the NFL’s most prolific offense, all in the package of a satellite back plus with a primary back frame. Fantasy gamers need to move away from the idea that Ware is an RB1 in a featured role. Williams has all the tools that zero RB drafters are looking for to give them that potential RB1 return. Anybody going with a zero RB approach during 2019 drafts will be targeting Williams and avoiding Ware in that sweet spot after hammering receivers for four or five rounds. The dynasty buy window has probably closed, but for the right price, Williams is an excellent pickup in dynasty leagues as well.